While last years fifth placed female Rachel Joyce won't be in Abu Dhabi this year, organisers of the Abu Dhabi International Triathlon (www.abudhabitriathlon.com) have confirmed the return of defending champion Nikki Butterfield to the March 2nd event, meaning that the 2012 top four ladies will be back for the 2013 edition. Abu Dhabi International Triathlon’s reigning champion, Aussie star, Nikki Butterfield, has postponed her planned retirement to defend her UAE capital title next month against what is expected to be the strongest female elite line up outside of the Ironman World Championship. 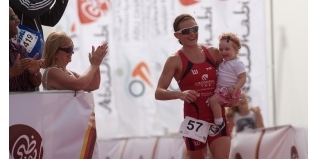 Having put her career on hold after her historic Abu Dhabi win to concentrate on having a second child, Butterfield has now teamed up with husband, Bermudan Olympic triathlete Tyler, who will make his UAE capital debut on March 2nd, to work round-the-clock in preparation for her flagship Abu Dhabi 223kms ‘pure power’ title defence. “One of the great things about keeping a detailed training diary and then doing well is I can now look back on what I was doing at a similar time and see where I am each week compared to last year, what I was doing, how I felt, my times, pace, heart rates etc.,” said Butterfield. “Some things this year are identical like my treadmill sets, run loops, bike intervals and loops, but I have made some changes,” explained the Brisbane mother who crossed Abu Dhabi’s finish line last year with daughter Savana in her arms to rapturous applause after holding off late charges from Angela Neath, Caroline Steffen and Melissa Hauschildt (nee Rollison), who are all returning to challenge her top spot. The former professional cyclist proved her racing pedigree when she drew on her extensive arsenal of experience to clinch victory on the energy-sapping 200kms bike leg, which ultimately led to her taking top spot two-and-a-half minutes ahead of the chasing pack. “The way the race panned out in 2012 and my edge over my competitors was simple, I used cycling tactics to work over the other girls on the bike. I actually tried to just ride away thinking in a non-drafting race that would be enough but as everyone knows, even when you sit at the legal distance, it's easier for the person behind, so to just ride away you have to be a lot stronger,” added super-cyclist Butterfield, widely regarded to be as versatile as she is fast. With one of the Abu Dhabi Tourism & Culture Authority (TCA Abu Dhabi) event’s strongest elite line ups due to take their marks next month, Nikki and Tyler will be putting everything they’re got into their Australian training period pre-race. “Tyler and I really like coming down to Australia to escape the Colorado winter. Whenever we're here we're basically on training camp and we're very focussed so it makes sense to choose a big race after a big training block,” added the fiery redhead. Tyler who finished fourth at the 2012 Ironman Arizona and is the reigning Pan American Champion, also represented Bermuda at his second Olympic Games in London, clocking the fastest bike split and placing 34th. He’s now going into the 2013 season with a long course focus. “Abu Dhabi is my season opener and it is a huge race to open with, but I like the big races as they are what gets me out the door to train,” said Tyler, who will join 2012 Olympic Gold medallist, Alistair Brownlee, in the capital next month for the event. The 2013 Abu Dhabi International Triathlon starts with a sunrise swim in the Arabian Gulf’s shimmering turquoise waters off Abu Dhabi’s Blue Flagged public beach, before weaving through closed roads along the Corniche Beach, up to the spectacular Yas Island and around the Yas Marina Circuit – home to the annual Formula 1™ Etihad Airways Abu Dhabi Grand Prix - before returning to the heart of the UAE capital.